Taking an unsecured loan with no credit check is highly risky. The type of lender that will engage in this transaction is often making multiple high risk loans, and this means the loan standards of the lender are very low. While this can seem like an advantage, a lender with low loan standards often compensates for the high risk with very high rates and unfavorable terms. You will need to look for high risk lenders in order to get an unsecured loan without a credit check. Nearly every lender will require a credit check in order to assure you are worthy of the loan. A lender will also want a credit check in order to verify your identity. A lender who agrees to forego this step will typically request collateral in exchange for the cash. Since you are looking for an unsecured loan, this option will not work for you. You will ultimately have to work with a very high risk lender. 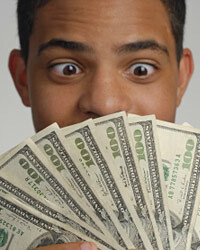 These lenders often require proof of income through a paycheck, called a payday loan. Other unsecured loans will use only your signature, called a signature loan. Both options have a lot of drawbacks. Loans from very high risk lenders often do not follow standard loan requirements. This means the lenders are less likely to abide by federal and state regulation. You are benefiting from this, because a lender following these recommendations will not make a loan with no collateral and no credit check. Unfortunately, you will also have to pay the price. The lender will be less likely to disclose all terms, such as adjustable rates or finance charges. You will have to do the work yourself to truly understand the contract you are signing. It is better to avoid this type of loan where possible. Even if you have bad credit, there are some less risky loans to consider. If you have any stocks or savings, you may be able to use these assets as collateral on a loan from an approved lender. Even though your limits will be lower in this case, your interest rates should also be lower, and your risks are inherently lower when working with a lender following standard loan procedures. There are very few times when taking a high risk loan is a good idea. However, if you have already exhausted all other options, taking an unsecured loan with no credit check may be the last chance you have to avoid detrimental financial circumstances. Take a high risk loan only if you have already asked friends and family for the money, have been turned down by standard lenders and are facing severe consequences if you do not locate the funds. In this case, be prepared to pay the loan back in full the second it is due, or you will find yourself in a worse position than when you first took the loan. Who Can Realistically Get An Unsecured Credit Consolidation?3 Precautions for Unsecured Bad Credit Personal LoansUnsecured Commercial Loans for Expanding Your Small BusinessCredit Cards For People with Moderately Bad Credit?